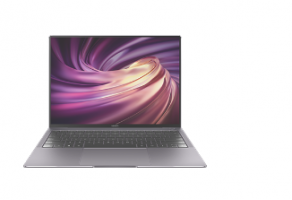 Huawei MateBook X Pro Laptop comes with Windows 10 Home 64-bit Operating System, 8th Generation Intel Core i7-8565U Processor ticking at 1.8 GHz Up to 4.0 GHz clock rate, 16GB LPDDR3 2133 Mhz Memory and up 1TB PCIe SSD Solid State Drive internal storage. Huawei MateBook X Pro Laptop also has DTS Sound,Integrated stereo speakers, Huawei True Vision web cam, Microphone, Full Size Backlit Keyboard with numeric keypad. The Laptop has 13.9 inch screen size, Width:304 mm x Height:217 mm x Depth:14.6 mm Physical Dimension and 2.93 lbs (1.33 kg) weight and Lithium-polymer 57.4 Wh (Typical Capacity) Battery. Charger 65 W, For devices with a PD protocol: output 20V / 3.25A, 15V / 3A, 12V / 2A, 9V / 2A, 5V / 2A; Otherwise: output 5V / 2A; Support multiple output modes, and quick charge for different devices.